That is what today marks, and as a Stratfordian it is a time to celebrate as I am sure they will be doing where my sister lives in the bard's home town. Hamlet - Act 1 Scene 1 "Not a mouse stirring"
This is Wanda's Morgan mouse and for the middle I covered a very small plastic ring thank you Wanda for a great pattern. But look at these cheerful mice made by Carollyn, aren't they great? On this momentous day come back with me 50 years when to mark 400 years since Shakespeare's birth we were given one of these books. I am afraid mine has travelled a bit and is rather worse for wear! She is the one wearing the pink hat and you can see her first helping the representative from New South Wales unfurl the flag and then walking in the procession. Notice the fellow on her right with a posy, he looks very uncomfortable holding it! They are on the way to the church to place the tributes by Shakespeare's grave. Sorry about the quality of the photographs but they have been taken from transparencies. 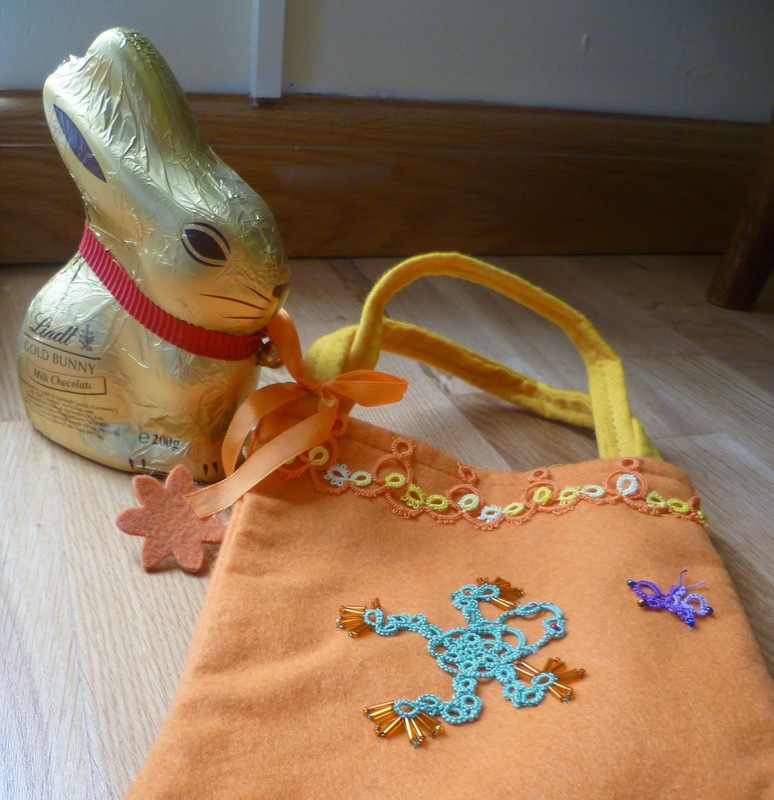 I am shattered after a really wonderful service at Winchester Cathedral last night and then Easter celebrations this morning, but did manage to sew the bunny trim onto a small bag last night and add some more embellishments. 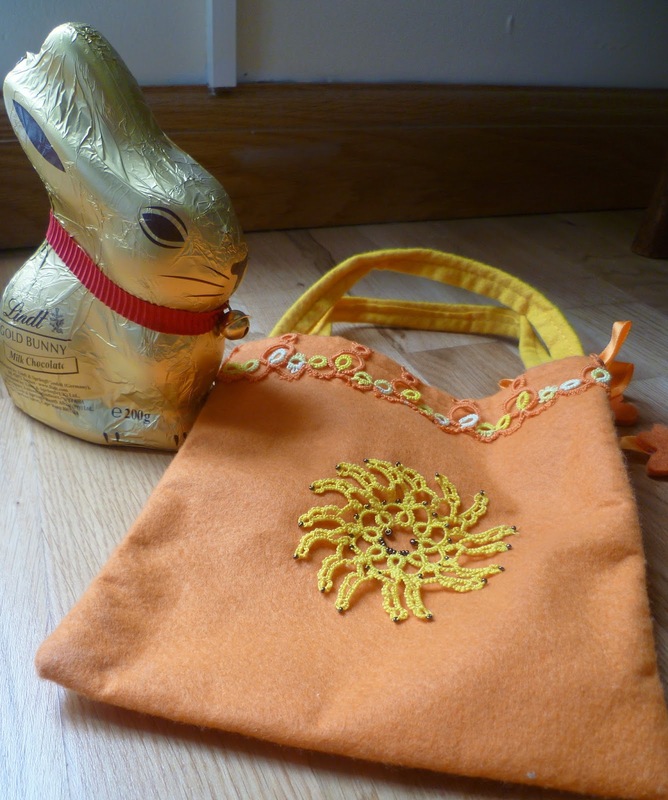 I have given the bag to my friend for her granddaughter as I don't have any grandchildren myself, so it seemed a waste to keep it. I found the frog and sun in my tatting stash. 'Im in the garage is busy making shuttles. 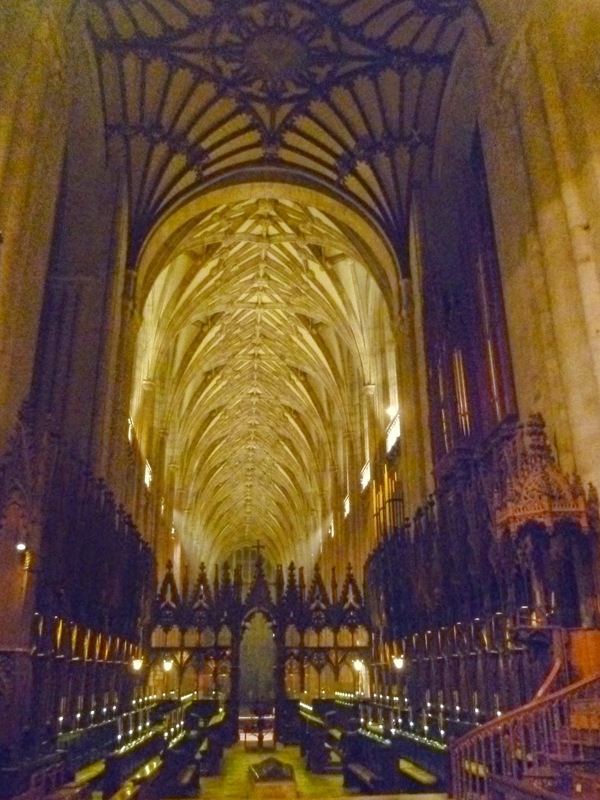 And finally a photograph of Winchester Cathedral after all the congregation had left last night. it truly is a magnificent building. Having been so absorbed with Renulek's doilies for nearly two months it was time to ease off and try some different tatting. Strangely enough though I rather enjoyed not having to bother with beads and the freedom of not using them was quite liberating! But I have so many beads and therefore it is not possible to abandon them for ever. I made these two button eggs, the pattern is on the right hand side bar of this blog. With all the best will in the world I am always clumsily knocking over beads or find them around the house. After spillages many can go back to their original container, but some have been major mishaps when beads of all colours have got mixed up. My solution has been to put them altogether in one container, a rainbow of colours. For these Easter eggs I just picked up that container and choose beads at random, which was fun and eventually hope to reduce the 'spillage container' over the next few weeks by making more. 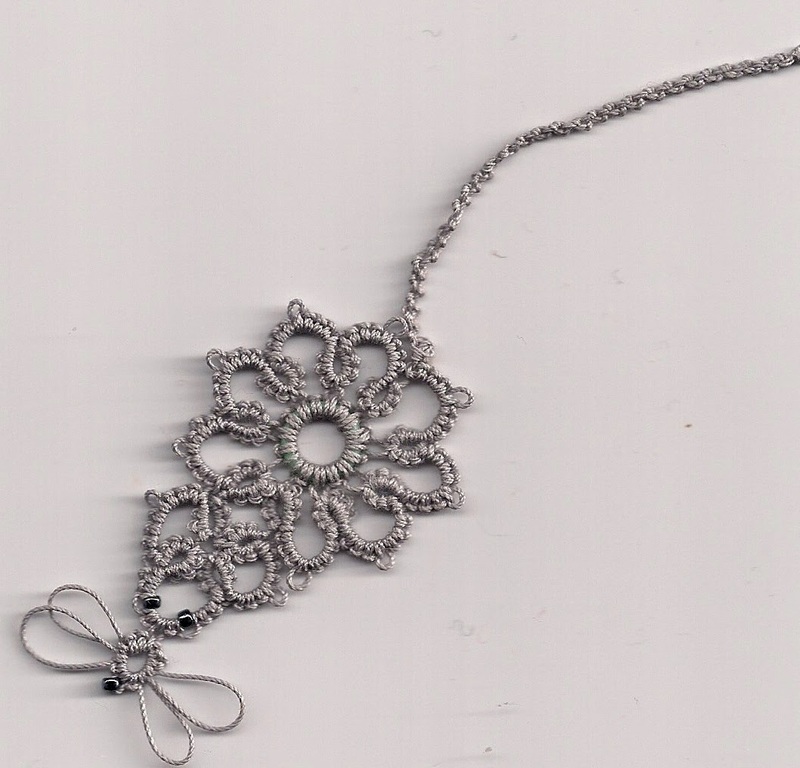 It seemed to take so long tatting Renulek's Spring doily, but it was well worth the effort. I did have to unpick bits where I had gone wrong which delayed finishing it, but finally on Saturday night it was completed. It measures 21" wide and is the largest tatted item I have ever made. I have used up a lot of old thread - Coats and Manuela, which was the main aim for tatting this item, but strangely enough as I look at the almost finished balls there is sadness as some of the colours are irreplaceable. I am continuing to complete another of the doilies which I started but that will be an on going project. I am entering this particular doily into a Creative Art and Craft Exhibition in July, as I am one of the co-organisers of this exhibition hopefully there will be no objections! The aim is to set up a table as a tea table with a wooden cup cake stand beside it. At this stage it is doubtful if the stand will work, so far the wood has been cut into largish rounds and the bark left on it. But as the wood drys out it may crack or the rounds may not look right as they will have to be graduated to make the stand. 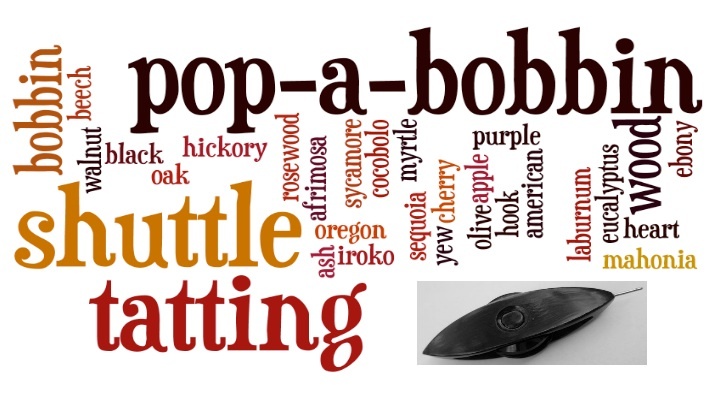 It also may look too chunky and not delicate enough. So in the meantime these small coasters have been made with a knitted cup cake as an example. Isn't the mottled look on the grain of the wood so pretty? There is always some sort of creative work being done either in the house itself or the garage!